The back of the painting is covered with a uniform layer of grey coloured gouache. The top third of the layer is washed out while the remaining two thirds do not present any alteration of the covering layer. A certain number of fullings and various tracings constituted of humorous inscriptions, drawings, sketches and signatures, some not easily interpretable appear on close observation of the faded part. On the bottom part no tracings are visible because the superficial part of the gouache layer has not been altered. Preliminary tests have shown that the gouache could not be removed without damaging the support. The examination by ultraviolet radiation of the back of the painting showed Picasso’s signature and has put forward a difficult legible sentence. The fluorescent ultraviolet phenomenon in the visible obtained by the Lausanne scientific police laboratory has enabled to photograph the whole of this sentence and to decipher a few words such as « Rouel » (for Durand - Ruel), the slangy catalan word « calés » followed by the mention 03 and Picasso’s signature. In order to decipher the entire sentence which is « A Fernandez Ilame Duran - Rouel y le dara muchos calés 03 », we called in the Paris scientific police laboratory. This deciphering was made possible thanks to the use of a VSC1 spectral video camera. In addition, drawings, sketches, inscriptions and signatures from different periods at superimposed levels, invisible under white and ultraviolet light, have been revealed and photographed through a cathodic screen. It is already difficult to reproduce Picasso’s drawings, which are inimitable because of his genius, starting from perfectly legible photographs but it becomes particularly difficult in the present case. This is the reason why, on several drawings that get mixed up in all directions on the back of the painting, only those perfectly defined and visible have been resumed, photographed and then redrawn on the photograph with a maximum of precision and rigour. Seventeen drawings have been disclosed using this method, then studied. It is interesting to remember that Picasso had the habit of covering the supports of his paintings with numerous drawings, sketches, inscriptions, signatures which were superimposed in all directions and were tangled into real scribbles (Roland Penrose). He did not like writing but was a fast thinker. 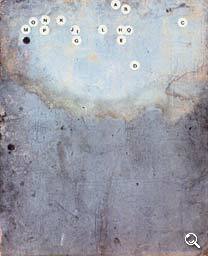 He translates his thoughts into signs and ultra- fast drawings rather than by sentences; what we call « signs - writings ». Picasso also used to retrace episodes of his or of a friend’s life in drawings together with comic strips like legends, which he called aleluya (Roland Penrose). The comic strip put forward at the back of the portrait of Woman in Blue with a Beret could be interpreted as follows: Picasso becomes keen on the idea of going to Paris as he had done previously and imagines this trip in advance.